Maybe you have your entire itinerary planned three months before you even get on the plane! Or perhaps, you’re more of the ‘wing it’ type of traveler, happy to make new discoveries by talking to locals once you’ve touched down and changing up your plan as you go? PART ONE: Cooking up a storm in Natori! Whatever kind of traveler you are, we can bet that you’re all after a tasty local meal! Natori City (just south of Sendai City in Miyagi Prefecture) is famous for producing ‘Seri’ (Japanese parsley). ‘Seri’ is a root vegetable with a unique crunchy texture and fresh, earthy taste. 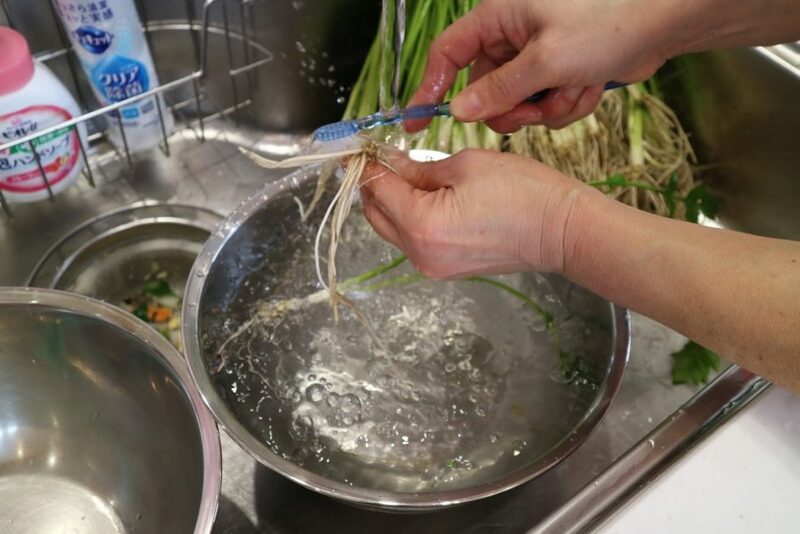 The entire plant is edible, and whilst many areas of Japan only use the stem and leaves in cooking, in Miyagi they use everything down to the roots – they are considered to be the best part. 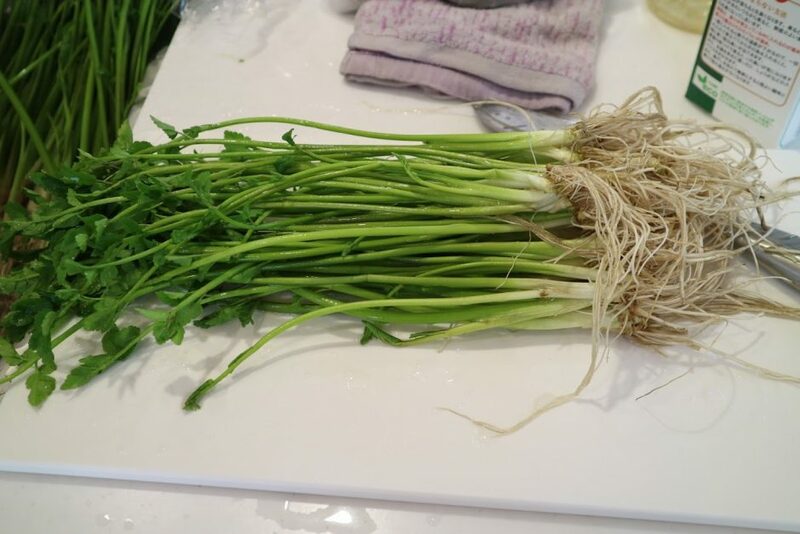 ‘Seri’ plant – the roots may look a little off-putting but they are the tastiest part! You can use Seri in a wide variety of dishes, but it is most commonly eaten in a hot-pot with either duck or chicken meat! Simple flavours, but incredibly delicious, particularly on a cold winter’s day (which also happens to be when Seri is in season). That was exactly what was on today’s menu: ‘Seri-nabe’ (Seri hot-pot) and ‘Ehomaki’, fat hand-rolled sushi traditionally eaten at ‘Setsubun’, a festival to mark the beginning of Spring typically held on February 3rd. First step: Washing the roots of the Seri! 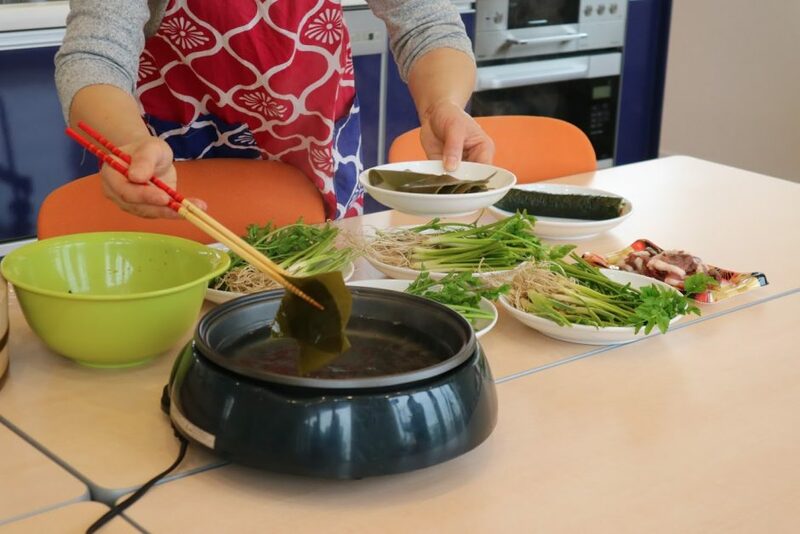 Next we made a super simple broth for the hot-pot using only stock drawn from Kombu seaweed and a dash of soy sauce. Super simple! 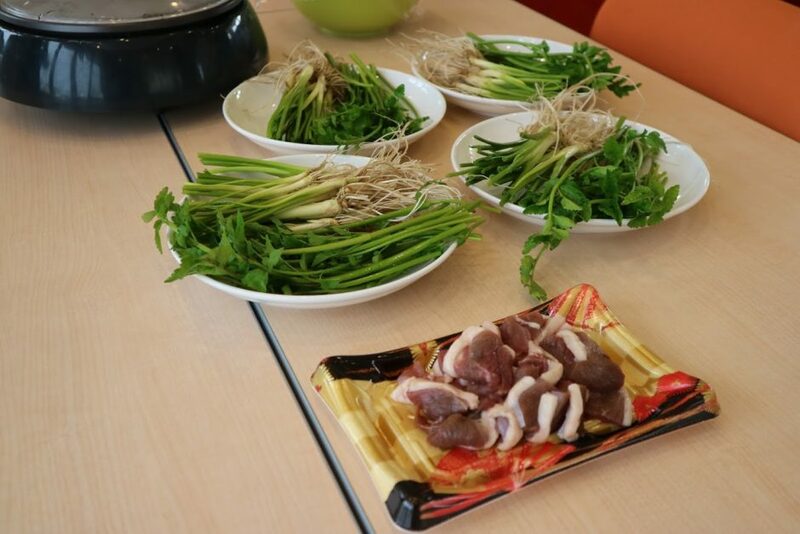 The main two ingredients of Seri hot-pot: Seri and duck meat. While waiting for the soup stock, it was on to challenge number two: Ehomaki sushi rolls!